This article ran in Wheatley Journal in May 2006 and highlighted vandalism at the Talbot Trail Golf Club in Wheatley that caused over $20,000 in damages to the course and buildings. The article, which was initiated by Crime Stoppers, proved successful as 6 young offenders and two adults were identified through tips to Crime Stoppers. As a result the two adults where charged with several offences and later plead guilty at court. The Special Project Award was awarded for the Chatham-Kent Crime Stoppers School Mural Project. This project involved a Trillium Foundation Grant for a two phased program involving Chatham-Kent’s Secondary Schools. Each school was asked to create a mural, designed by the students, to reflect their school, their community and include a message of good citizenship, sound decision making and an anti-crime message. Crime Stoppers provided each school with all of the necessary supplies as well as the expertise of local mural artist Penelope Duchesne, who acted as a consultant for the teachers and students, to create their mural. The results were incredible. Each school produced unique and incredible pieces of art that have become permanent fixtures of their school. In the second phase of the program every secondary school student (7,500) in Chatham-Kent received a carabineer key ring displaying the Crime Stopper and Trillium Foundation Logo as well as our 1-800-222-TIPS phone number. This submission was broadcasted on BLACKBURN RADIO INC. between October 10th and October 16th, 2005. The broadcast ran 4 times a day and featured a public service announcement to the citizens of the eastern part of community. This area was being overrun by break and enters, and it was obvious from the items that were stolen and methods used by the thieves that these thefts were being done by an organized group. The submission also contained a reminder to the citizens of Chatham-Kent to lock their sheds, barns and garages as well as a plea to call Crime Stoppers with suspect information. The broadcast resulted in numerous calls to Crime Stoppers of possible suspects. As a result 8 suspects were arrested, $340,000 in stolen property and $100,000 in drugs were seized. The Board of Directors for the Chatham-Kent Crime Stoppers programme would like to thank the support of all our Media Partners, the Ontario Trillium Foundation, and the students of Chatham-Kent’s Secondary Schools and Penelope Duchesne for their enthusiasm and creativity; helping make the Chatham-Kent Crime Stoppers programme one of the best in the province. Together we can make it happen!! 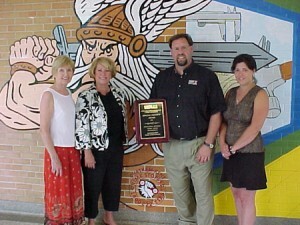 Pictured above: Diane Flook, Trillium Foundation, Sandy Braendle, Trillium Foundation Program Manager, David Bakker, Crime Stoppers Coordinator and Penelope Duchesne with the OACS 2005 Special Project Award. This award was presented for the broadcast of a Crime of the Week, produced by Shannon Medaglia, written by Jay Baker and voiced by George Brooks, promoting Operation Pot Spot. This award was presented for the printing of a two page Crime of the Week feature by, Sheila McBrayne. The story reported a serious crime of the week as well as several unsolved crimes from the previous year. 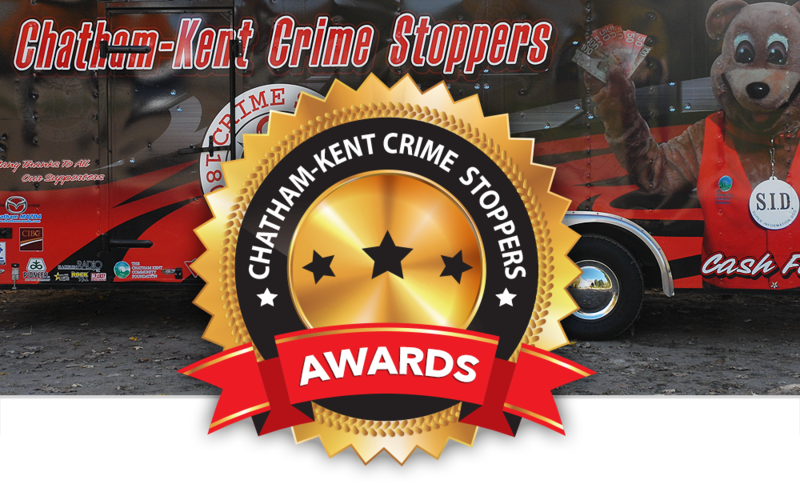 This award was presented for the broadcast of a feature story by Rick Walker on Operation Pot Spot program and marihuana eradication in Chatham-Kent.